Before planting, check with your local council (Parks Officer) or DOC to ensure the species you select is ecologically correct for your area. Pohutukawa and rata grow to become huge trees, which can cause problems if planted on small suburban sections, or near fences or other structures on farm land. The location of underground drains and water pipes also needs to be taken into account. Download our information sheet for all the information you will need on How to Grow Pohutukawa or Rata. Project Crimson supports pohutukawa and rata protection projects within their natural growing ranges and promotes eco-sourcing. This means that the plants used in restoration projects are grown from seeds collected from old, naturally established plants as close as possible to where they will be planted-out. Project Crimson contracts several community nurseries around the country to grow trees from known eco-sourced seed for distribution to projects. Eco-sourcing improves the quality and quantity of native vegetation and protects the distinctiveness of plants and eco-systems. One of the major levels used for the ecological classification of land. New Zealand has been divided into 268 ecological districts according to geological, topographical, climatic and biological features and processes, which interrelate to produce characteristic landscapes and ranges of biological communities. A single, very distinctive ecological district, or more commonly, a group of adjacent ecological districts which have diverse but closely related ecological components and relationships. How fast do pohutukawa grow, how big do they get and how long does it take? Young plants grow faster than older plants. In a very fertile environment with good moisture and plenty of room, young plants grow at around 30cm per year and the older ones at around 10cm with 2mm on the girth. Pohutukawa can grow to 20m high with a 35m crown. In the natural coastal environment you see trees that are literally hundreds of years old. It is also common to see large species cultivated in some home gardens, which would be 100 years old. I have several pohutukawa trees that have sprung up on my property, but I don’t want to keep them. What should I do with them? Ask your local school if they would like the trees. Schools are always wanting trees to provide shade during the summer. It is best to transplant trees in the winter months. A pohutukawa on my property has been planted in a place where there is inadequate room for it to grow. How easy is it to transplant a pohutukawa and when is the best time? Pohutukawa transplants well, although forward planning is required. It is best to attempt to transplant in winter. Firstly cut around the root ball – trench around the outside to the shape of the crown, then water the tree. Leave it for two or three months. This will allow for new fine roots to establish. Then carefully lift out the tree so as not to disturb the root ball and transplant it. Well in advance of transplanting the tree, dig a new hole and prepare it with compost. How and when do I prune my pohutukawa? Undertake any work when the tree is most dormant – i.e. mid winter. However, reducing the size of a pohutukawa is not easy. If you cut large branches back you will precipitate epicormic growth back along the remaining branch which thickens up the within tree foliage. In shaping pohutukawa we aim to retain the umbrella shaped outer canopy while lifting the crown and creating a view beneath it. You end up looking through the stems beneath the crown, so you don’t want epicormic growth. It is important to keep a balanced crown so if any large branches are to be removed it should be done right back at the trunk, but not so that it leaves a lopsided or large gaps in the crown. A bit tricky, it is difficult to retain the overall shape of the tree when removing major branches. I have a 12 year old pohutukawa which has grown well but refuses to flower. Is there anything I can do to encourage flowering? If the plant was grown from seed then it may have gone to vegetative growth every year and failed to form flower buds. This might be just a genetic peculiarity of the specimen or to do with the environment it is planted in. The ability of the species to switch between vegetative growth or flower bud formation makes long periods of non-flowering a possibility. If, however, the plant was grown from a cutting or purchased from a nursery, the problem is likely to be related to the plant’s environment. This is because no nursery person would propagate from a non-flowering tree. Why do some pohutukawa sometimes flower twice in a season? It would be highly unusual for a Metrosideros excelsa to flower more than once in a season. Trees in a group may flower at different times over summer, giving the appearance of two flushes of blooms. However, individual trees in the group would only flower once. Some Metrosideros hybrids do, however, flower twice. A coastal site of pohutukawa seems to be infested by a beetle. The beetles have chewed the young growth from the majority of the currently infested plants. Can you suggest a method for discouraging/repelling this beetle? The beetle is the Native Bronze Beetle (Eucolaspis brunneus). It will indeed cause a lot of visible and cosmetic damage to Metrosideros, but this damage is of no concern to the plant’s health. The tree will grow new leaves within a month or two. Bronze beetles fly in the spring months and have a tendency to occur in large numbers. They lay eggs on the soil, when the eggs hatch tiny larvae or beetle grubs tunnel into the soil and feed on the roots of the same plant – during autumn and winter. The larvae therefore restore the imbalance (root/foliage ratio) caused by the adults. We are relocating overseas and when we do put down our roots, we would love to put down some pohutukawa roots with us. 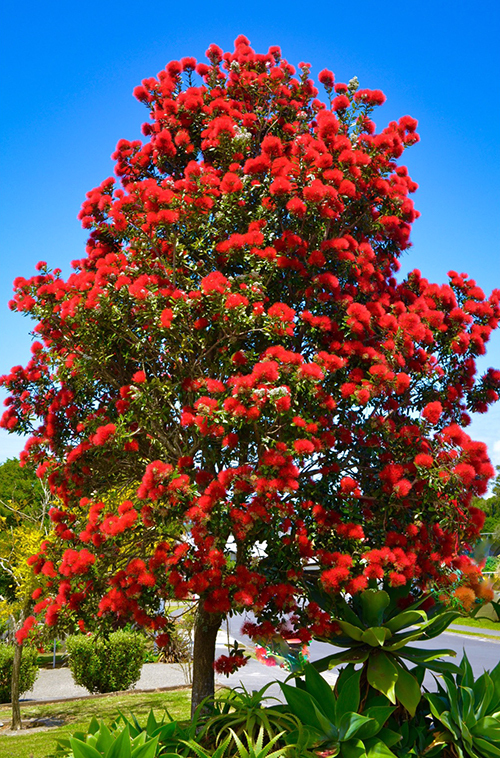 Project Crimson works with mainland pohutukawa (Metrosideros excelsa) the large prolific coastal tree we all love. 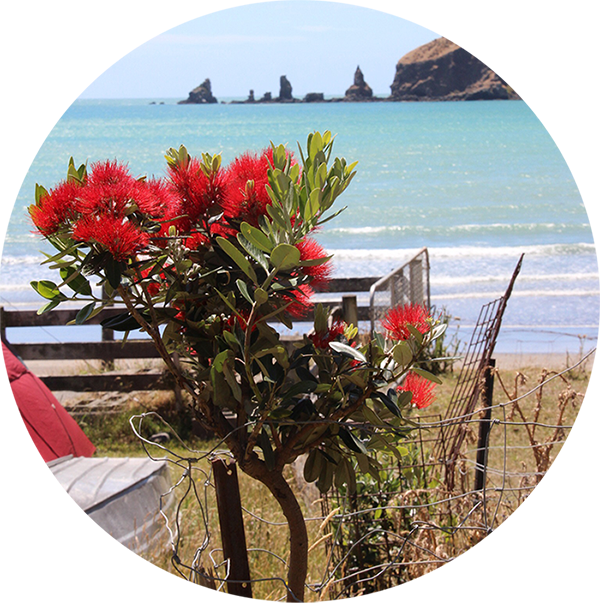 As the Trust does not advocate planting pohutukawa outside of its natural growing area (north of a line drawn from Gisborne to New Plymouth), it is therefore impossible for us to recommend taking the species to another country. A very good example to support this is the south-western tip of South Africa where pohutukawa has been listed as a serious alien invader due to stands of impenetrable pohutukawa growing there. Does an exceptionally heavy flowering season mean my pohutukawa is extremely stressed and under threat of death? While it is generally true for many flowering trees that when they are in strife they tend to flower heavily, we doubt this is true for pohutukawa. The species may respond to environmental stress however so that the year following a drought for example heavy flowering may occur while following a moist good growing year it may crack on the vegetative growth. No-one has shown what it is that determines whether a tree sets a vegetative bud or a flower bud, but you can bet it is an environmental trigger. Our native beeches (Nothofagus) have similar complex mechanisms which lead to a mast (heavy flowering) year about every 7 years, which may also be drought related. So in short heavy flowering by a pohutukawa tree probably indicates that the next year is likely to be focused on vegetative growth. Pohutukawa is amazingly resilient. It can take an enormous amount of abuse and still bounce back. The very big and old trees are the greatest at risk as the wood to foliage ratio is high. This means that there is lots of wood supported by limited foliage. Young trees have a low wood to foliage ratio – a lot more foliage relative to wood. When an old tree is in danger of dying from say possum defoliation, the ultimate solution is to cut it off about 2m from the ground. They usually sprout like crazy and the wood to foliage ratio is rapidly reversed and they grow like teenagers again. Before taking this action however, please of course contact your local council to find out the rules for carrying out work on trees in your area. My pohutukawas are not flowering, is there something wrong? It is thought that flowering is related to the previous summer’s conditions, but there are so many variables, that it can’t be narrowed down to just one factor. The trees respond to different conditions. The main thing would be that the trees themselves are healthy, that they are not being impacted on by some type of run off or some local possums. I planted a pohutukawa but it has never flowered, what’s wrong? It really depends on whether the plant was grown from seed or cutting. Plants grown from seed will generally take 2-3 years longer than those from cuttings. But plants grown from seed have more genetic variation rather than being a clone of their parent plant. As long as it is healthy then you should be seeing some flowers eventually!